Proceeds from this fun, friendly competition will go to various charitable organizations selected by each participating brewery. Eight brewery-on-brewery boxing matches in a professional ring under the big lights at the Fifty West Brewing Company Pro Works Facility, plus 80 local brews on draft & live music! BC Bottle Lodge Specialty Bottle Tent Ticket: $35 advance (limited availability) - Includes access to the BC Bottle Lodge Specialty Bottle Tent + General Admission + early access to the event at – 3:00PM. Join us for Tastings of rare and Specialty Bottled Products curated by brain trust of BC Bottle Lodge and the brewers of Fifty West. Share run time goes from 3PM-6:30PM. Upgrade to Ringside seating for $45. 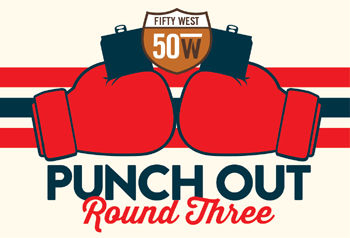 Get Ready to Rumble with Fifty West Brewing Company at Punch Out: Round Three. Located at 7605 Wooster Pike.